Who is West Coast Metric Inc.
What makes WCM window rubber the best? 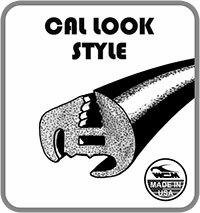 What is the difference between Cal-look or American window seals? What order is the correct way to install American style window rubber? How long will my order take to get to me if it is shipped FedEX standard ground? What is WCM’s return policy? What’s the difference between German or Brazilian Parts & Door Seals? Why offer both German and Brazilian Parts? Can I order a complete restoration kit for my car? How do I warranty my lifetime warranty WCM rubber? Do all of your products in your catalog carry a Lifetime Warranty? This disclaimer governs your use of our website. By using our website, you accept this disclaimer in full. West Coast Metric Inc. (WCM) reserves the right to modify these terms at any time. WCM is not responsible for, and expressly disclaims all liability for damages of any kind arising out of use, reference to, or reliance on any information contained within the site. The information contained in this website is for general information purposes only. And while we attempt to keep the information current and correct, we make no representations or warranties of any kind, express or implied, about the completeness, accuracy, reliability, fitment or availability with respect to the website or the information, products, quantities, or related graphics contained on the website for any purpose. Any reliance you place on such information is therefore strictly at your own risk. In some circumstances due the calculated shipping amount may be higher. Estimates may vary due to odd sized boxes or parts. In addition this amount may not reflect any International Customs, Duties, or Imports Fees, which we have no control over. We will accept returns or exchanges for a period of up to 60 days from the invoice date. After 60 days, all sales are final. There is a Restocking Fee of 20% assessed to all returns. There are no refunds on goods damaged, installed, or not in original condition. All sales are final on electrical items. Once you have been given the RGA #, the return must be sent to WCM within 30 days. WCM is not responsible for installations that are improperly done. Products that have been installed or are damaged during installation are not returnable. Any personal information submitted via this website will be used solely by West Coast Metric and will not be disclosed to any third parties. We thank you for your business and respect your privacy. Claims for damaged shipments should be made by you to the carrier as soon as the damage is discovered. It is your responsibility for filing a damage claim with the carrier. The carrier will then contact us after inspection of the merchandise and issue a claim number. If you have not received the exact number of packages as indicated on the invoice, a claim must be made immediately with the carrier. We are neither responsible for, nor in a position to make or accept a claim after a carrier accepts the shipment from us. If you receive the correct number of packages as indicated by the invoice and find items missing, please contact WCM within 24 hours of receipt of goods. WCM accepts all major credit cards. Q: Who is West Coast Metric Inc.
A family owned and operated business since 1977, WCM has been a leader in importing and manufacturing quality parts and accessories for Volkswagens. Additionally, we have manufactured many parts here in the U.S.A. which have been discontinued by Volkswagen. In doing this we have made sure that parts made by WCM meet or surpass the original in look, fit, and quality. Our parts are manufactured to strict tolerances, and we select grades of rubber and other materials that will last. By owning the tooling of over 60% of our products, we have been able to ensure that this high quality standard continues today. All rubber and plastic parts manufactured by WCM are guaranteed for the life of the vehicle. Maintaining a high fill rate is important to us, and it is our policy to stock adequate levels of inventory. Keeping back orders to a minimum. Q: What makes WCM window rubber the best? WCM window rubber is the best for a several	reasons. First, we use a synthetic material that is stronger, more durable and can withstand extreme temperatures far better than the competition. Second, the extrusion we use is identical to the original extrusion, which makes the fit on the vehicle perfect. Third, the technique we use to splice the rubber together makes it virtually impossible to break. We do not just glue our window rubber together. Thus we can proudly offer a lifetime guarantee for the rubber seals WCM manufactures. Q: What is the difference between Cal-look or American window seals? Cal-look window rubber is plain rubber. Where as American style window rubber has a groove to accept metal or plastic decorative trim. American style seals are much more difficult to install but they are both made with same premium rubber and both styles fit perfect. The two styles are purely aesthetic and the choice is under the discretion of the buyer on how they want their Volkswagen to look. 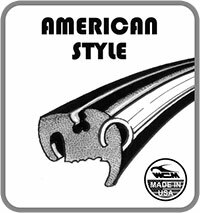 Q: What order is the correct way to install American style window rubber? First you install the window seal to the glass. Second you install the aluminum trim into the seal. Third, place the glass, seal, and trim, as one unit into the vehicle. Orders usually ship the same day if the order was taken before 1:00 P.M.(Pacific time) Web orders placed during closed hours will ship the next business day. Occasionally we may hold orders for a few days to wait for missing items. Q: How long will my order take to get to me if it is shipped FedEX standard ground? California residents usually get their orders in 1-2 days. Southwestern residents will wait approximately 2-3 days. Midwestern states are about 3-4 days away. Eastern states take approximately 5-7 days. Time is estimated in business days. Q: What is WCM’s return policy? We will accept returns or exchanges for a period of up to 60 days from the invoice date. After 60 days, all sales are final. There is a Restocking Fee of 20% assessed to all returns. There are no refunds on goods damaged, installed, or not in original condition. All sales are final on electrical items. Before returning an item, please contact WCM for a Return Goods Authorization number (RGA #). This number must be written on all packages to be returned, or the packages will be refused. Please include a copy of the invoice with a brief reason for the return. All returns must be sent to WCM freight pre-paid. We will not accept any returns that are sent C.O.D. Once you have been given the RGA #, the return must be sent to WCM within 30 days. Damage Claims for damaged shipments should be made by you to the carrier as soon as the damage is discovered. It is your responsibility for filing a damage claim with the carrier. The carrier will then contact us after inspection of the merchandise and issue a claim number. If you have not received the exact number of packages as indicated on the invoice, a claim must be made immediately with the carrier. We are neither responsible for, nor in a position to make or accept a claim after a carrier accepts the shipment from us. If you receive the correct number of packages as indicated by the invoice and find items missing, please contact WCM within 24 hours of receipt of goods. WCM is not responsible for installations that are improperly done. If you encounter a problem with a part during installation, please email or call a WCM representative for assistance at (310) 325-0005. We will be glad to offer any installation tips we may have to help you. Products that have been installed or are damaged during installation are not returnable. Q: What’s the difference between German or Brazilian Parts & Door Seals? You may notice that we carry two kinds of the same part. Usually German or Brazilian which refers to where the parts are made. So you may ask “What’s the difference between the two?” First of all both are made to fit. The difference is the overall quality and price. German Parts for VW’s are made off the original VW German tooling and tend to last much longer as compared to Brazilian. They also typically fit better as they are made from the original VW factory tooling. German Door Seals have a sponge like feel, and are light grey when brand new. Just like they were on your car direct from the VW factory. This grey appearance is due to the powder used to release the seal from the mold when made and will turn black over time. We recommend German or USA made Door Seals and parts for those who wish to have the best quality for restorations that will last for decades to come. Restore it once, restore it right! Bazilian Parts & Door Seals are made to fit your VW and are are for the budget minded person or someone looking to sell the car. Both German or Brazilian will work fine, however Brazilian happens to be a lower quality due to the materials they use and are therefore cheaper. They also will not last as long as the German counterpart and will have to be replaced much sooner. Q: Why offer both German and Brazilian Parts? We offer both types to give the customer a choice of which grade they want to purchase. We understand that sometimes the budget is just not there for the higher quality and that not all restorations are the same. It’s important to give customers the option to purchase either German or Brazilian. Once again both types will definitely work, it’s just that the German parts typically fit better and last longer. Please note that sometimes German seals and parts are no longer available or supply is difficult and that Brazilian may be the only option available. Q: Can I order a complete restoration kit for my car? There are a few kits that if put together would be the primary rubber and plastic needed to complete the cars rubber restoration. There would be a Window rubber kit, a Door kit that does both doors and a Body kit. A few miscellaneous items you may also need however with those 3 kits you would have it almost covered. Q: How do I warranty my lifetime warranty WCM rubber? The rubber must be taken to the point of purchase. Reputable distributors can call us on warranties and provide their customers with new rubber if they choose to. Customers who purchase directly from us can come to us direct, and get rubber replaced after it has been established it is indeed WCM manufactured rubber through proof of purchase by invoice or our records. Please save all invoices for your records. Q: Do all of your products in your catalog carry a Lifetime Warranty? No. Only products that WCM manufactures carry a lifetime warranty. RETURNS / EXCHANGES: We will accept returns or exchanges for a period of up to 60 days from the invoice date. After 60 days, all sales are final. There is a Restocking Fee of 20% assessed to all returns. There are no refunds on goods damaged or not in original condition. All sales are final on electrical items. Before returning an item, please contact WCM for a Return Goods Authorization number (RGA #). This number must be written on all packages to be returned, or the packages will be refused. Please include a copy of the invoice with a brief reason for the return. All returns must be sent to WCM freight pre-paid. We will not accept any returns that are sent C.O.D. Once you have been given the RGA #, the return must be sent to WCM within 30 days. DAMAGED GOODS: Claims for damaged shipments should be made by you to the carrier as soon as the damage is discovered. It is your responsibility for filing a damage claim with the carrier. The carrier will then contact us after inspection of the merchandise and issue a claim number. CLAIMS: If you have not received the exact number of packages as indicated on the invoice, a claim must be made immediately with the carrier. We are neither responsible for, nor in a position to make or accept a claim after a carrier accepts the shipment from us. If you receive the correct number of packages as indicated by the invoice and find items missing, please contact WCM within 24 hours of receipt of goods. INSTALLATIONS: WCM is not responsible for installations that are improperly done. If you encounter a problem with a part during installation, please call a WCM representative for assistance at (310) 325-0005. We will be glad to offer any installation tips we may have to help you. Products that are damaged during installation are not returnable. If you select during the order process or at other times when you submit personally identifiable information, the information you provide may be used by West Coast Metric to create and deliver to you our newsletters, surveys or other communications containing product information. If you prefer not to receive such Communications, please do not select the ‘Please inform me option’. If you do select this option and later decide that you would no longer like to receive these communications, please use the features made available to you. If you have requested a West Coast Metric brochure, all information is kept completely confidential and is not shared with any third parties. We may, on occasion, send you an updated catalog or brochure. If you do not wish to receive any mail from West Coast Metric, please contact us via email at . Include your name and mailing address and email address. You will be removed from any future mailings. If you have elected to provide us with your contact information, e.g., by registering at the Site, emailing our Customer Service department or placing an order, we may provide you with service related announcements concerning the Site or contact you regarding your customer service requests or your order. For example, all registered users will receive an email to confirm their order. These types of communications are necessary to serve you, respond to your concerns and to provide the high level of customer service that West Coast Metric offers its customers. We will never provide your personally identifiable information to third parties for their use in marketing their products or services to you without your consent. West Coast Metric takes great pride in having you as a customer and we will ensure your privacy as a customer. West Coast Metric does not sell or exchange names or any other information about our customers with third parties. www.westcoastmetric.com does recognize your ISP (internet service provider), however, we cannot identify you as an individual. If you make an on-line purchase we do collect information (such as sales statistics and traffic patterns) to help improve your shopping experience. We keep all information confidential. West Coast Metric seeks to protect the security of your personal information both online and offline. All credit card transactions are secure. Every on-line order is encrypted and sent through a secure server, using SSL technology to prevent information from being intercepted. If you are a registered member at West Coast Metric, you can change your personal information at any time by updating your information at check-out. We welcome your comments and questions about privacy. Please send email to info@westcoastmetric.com. We are confident that your visit to West Coast Metric is secure and safe. However, you may choose to call us directly to place your order over the telephone. Please call Customer Service toll free at 800-247-3202.